The 1949 Vincent Black Shadow Series C was sold at auction on 10th May for £85,204.00 including buyer’s premium and VAT. 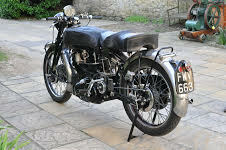 The 1937 Velocette Works 500 did not reach its reserve price. The sale was at Charterhouse, Sherborne, Dorset. Phone: 01935 812277.